That's the title of a book I wrote. Guess what it's about! It's about how to make a complete map of every thought you think! But it has some other things in there; It talks about visual language, maps, computerized notebooks, theory of notebooks, yadda yadda yadda. 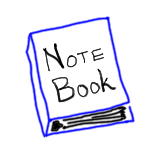 I'm afraid it's not really written well, but if you are interested in the topic of intelligence augmentation and notebooks, I think you'll overlook it's obvious flaws, for an enjoyable experience. Special thanks go to Adam Gurno for creating the PDF file! A million thanks! Thanks also to Phil Patton, and other reviewers, who's reviews are being collected, in preparation for the next version. Have you read the book? Would you like to write a review of it? Apply Visual Language technique to the book. Open Hyperdocument System - Douglas Engelbart's system. People talk about this sort of thing on misc.creativity and alt.self-improve. Be sure to see the 43 folders wiki and blog!